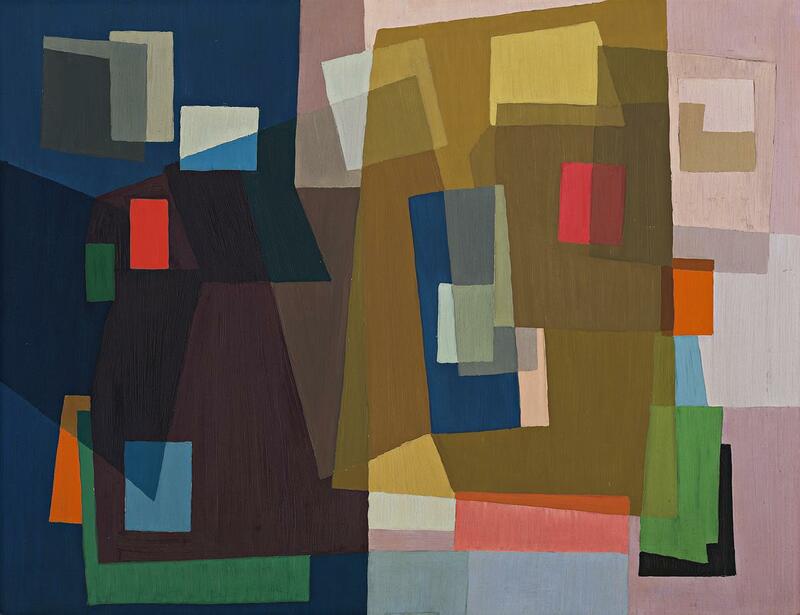 While some of Balson’s constructive paintings follow the right-angled geometry of Mondrian, who he once described as his ‘greatest single influence’, this work from 1953 breaks away from the order of verticals and horizontals, juxtaposing a series of less regular shapes that playfully jostle for prominence. There is an energetic movement across the painting’s surface in the complex layering of forms and the push-pull between positive and negative space. Striking colour relationships play a key role too, as oranges and vivid watermelon pink sit atop rich blues and purples, olive green and to the right, paler shades of mauve and grey. While at first glance, some colours appear to have been painted over others to create a darker tone, each colour has been applied individually, independent of those immediately adjacent, emphasising Balson’s understanding of colour and virtuoso skill with the chromatic possibilities of his medium. One of the larger scale works painted towards the end of his constructive series, this painting reflects Balson’s confidence and mastery of abstract form and colour. 2. Harding, L., ‘Part One: 1920-1970’, Harding, L. and Cramer, S., Call of the Avant-Garde: Constructivism and Australian Art, exhibition catalogue, Heide Museum of Modern Art, Melbourne, 2017, p. 43. The exhibition at Heide Museum of Modern Art, on display from 5 July – 8 October 2017, features numerous ‘constructive’ paintings by Balson.